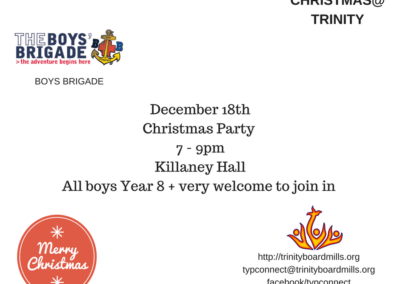 The Boys’ Brigade in Trinity, Boardmills meets in Killaney Hall each Monday night from September to March. We have three sections: Anchor Boys for 5-7 years, Junior Section for 8-11 years and Company section for 12- 19 years. The facilities of the hall and Church football pitch allow the boys in each section to take part in a range of activities including sports such as football, volleyball, basketball, and team-based games helping boys to work together, developing many important skills. There is a strong emphasis on scripture, badgework and drill throughout the Boys’ Brigade. Passages from the Bible are taught and discussed. This will give boys the opportunity to build a foundation of knowledge, which we pray will grow into a personal relationship with God. Through badgework boys will learn key skills from map reading to learning about the environment, as well as contributing to the community through voluntary service. Drill has always formed a fundamental part of the Boys’ Brigade programme and still takes place, helping to develop discipline. 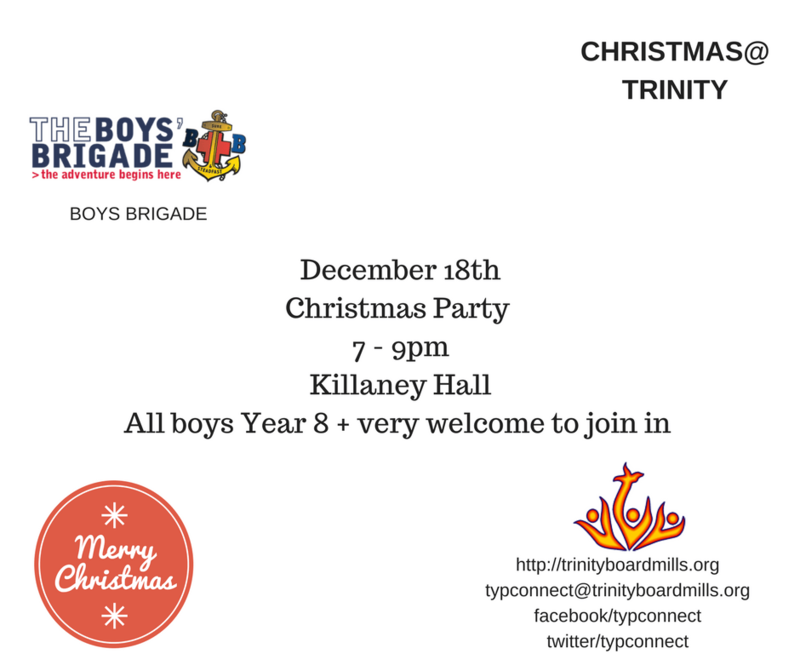 The aim of the Boys’ Brigade is ‘the advancement of Christ’s Kingdom among boys and the promotion of habits of Obedience, Reverence, Discipline, Self Respect and all that tends towards a true Christian manliness’. This we try to achieve by combining all aspects on each night, following the example of the dedicated leaders. The Boys’ Brigade motto, ‘Sure and Steadfast’, encourages us to be true and strong as men who hold on to Jesus Christ as our anchor in life, and is why the cross holds the central position on the crest. present Captain, Robert Kirk. Throughout these decades there have been and still are many faithful and dedicated leaders with a love for God and passion for the work of the Boys’ Brigade in this community. Our numbers have been consistent and the family-like atmosphere has made it a place where members from all backgrounds have felt at home within the company. Boys take part in a number of special services and events throughout the year: Enrolment Service, Remembrance Service, Down Battalion Parade and the annual Display when family and friends see something of what the boys have done all year. The boys also enjoy a number outings such as sports’ matches, car shows or a weekend away fishing. The Company is always open to new members who would like to join us!